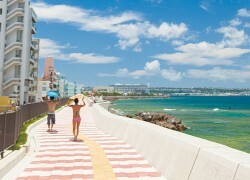 The area along Chatan's Miyagi coast is known as a mecca for water sports, including diving and surfing. Featuring a large soft coral reef system called ohanabatake, meaning field of flowers, the area is dotted with various dive spots that are easily accessible from the coast and always crowded with divers. A number of ocean view cafés, restaurants and bars are scattered along the Miyagi coast.